These blades are engineering perfection! Narrowing twisted blades are the BEST! Very resistant to ultraviolet light! 17mm hub center fits most older GM/si type alternators. Mounting holes are .245" with .930" hole center spacing. designs competing.That is where the whole argument originally started. perverted for PROFITEERING sake $$$Â All propellers with 3 blades or more are behaving "more like a round wheel"
working 'in-a-pinch' by removing the blade on the opposite side. Whalaa! It works again and the balance is perfect! You can't do this if your blades are in ODD numbers due to horrible vibration. Dec 2011 and January 2012 we had over 100 mph winds in the UK and all my turbines still stand unbroken now that’s some wind force that’s hit them hard. I have used and made many types of wind fan blades I used to make heavy duty alloy but problem is when one bends they become out of balance and can shake the turbine violently in high wind making it much more dangerous. Also thick tip blades make more noise unless they are made for very low rpm. And if one came off I would not like to be hit by one as they weigh a good few kgs. That’s why the black or mean green are the choice of blades, they are light and strong and if one should happen to came off it would not go thru roofs of windows at high speed because it would loose momentum as soon as it broke off it would disperse without causing damage because of the lighter weight. Turbines should be mounted a minimum of 35ft from ground and fitted with green or black to our Hornets then you can make 1400watts in high wind. If you want more power You can make a small and safe wind farm that is easy to maintain. -Protect your system with fuse of the proper rating fast blow will protect PMA burn outs. 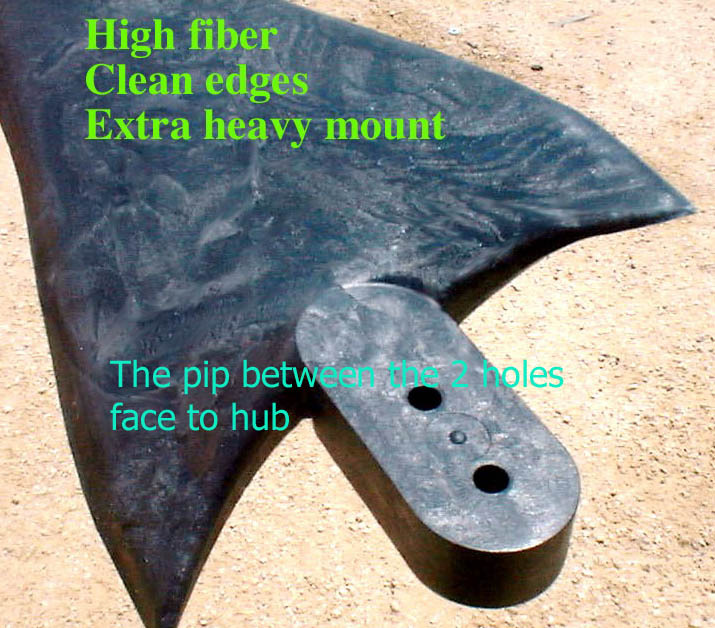 -Fit our green or black blades for high rpm. -If battery’s charging then fit a dump load relay. -Make tower strong to withstand high winds also make it fold down for maintenance. -Fit at least 3 guy wires one with hand operated winch. -Use quality multi-strand AC or DC cable.